Today was a wonderful day for our family! We added a new member…Mugsy! Mugsy! No, he doesn’t normally look possessed. Thank you camera. Mister finally gave in to his missing-a-dog-in-his-life feeling. 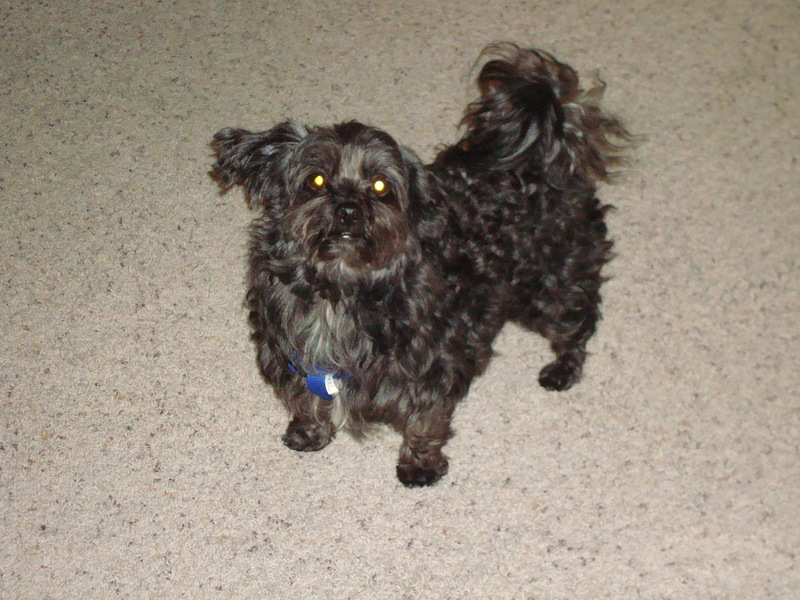 He had two Shih Tzu‘s for over 16 years, but they passed away several years ago. From everything he says about them, as well as others who had the pleasure of knowing them, they both were absolute darlings. Mister fell in love within the first 5 seconds, and same for Mugsy with Mister. The minute I saw their connection, I was in love too! I have been catching him looking at rescue websites to see if there were any Shih Tzus who needed to be adopted. This past weekend a facebook friend of ours posted some pictures of a sweet doggie, and that did the Mister in. He spent the rest of the weekend searching for Shih Tzus in our area, and came up empty. So, he posted a Craigslist ad asking if anyone knew of someone needing a home for a Shih Tzu. Less than two hours later we received a reply! The story is that Mugsy’s first home was with an elderly woman who became too ill to care for him. Her neighbor took him in, but apparently wasn’t sure how to take care of him and maintain his fur, and so he ended up quite matted. She gave him to a woman in Bullhead City who rescues dogs from kill shelters in surrounding areas. She cut his hair and cleaned him up. Her daughter was the one who replied to our ad, letting us know that she had planned on taking the dog from her mother, but wasn’t able to follow through. She asked if we would consider him because her mother could no longer care for him, and so she sent us pictures. Then, I fell half in love with the little feller. We made arrangements to meet with him today. The moment we opened the door and saw him, I fell completely in love. Mister was only four seconds behind me with the falling in love part. The dog’s name was Jaques, but they called him Joey as well. He was a delight, running back and forth between all of us. Playing, pawing at the ground, hopping around, and rolling over to let us pet his belly. There was no way we were going home without him, and he immediately became part of our family! All relaxed and enjoying his new home. We didn’t really like the name Jaques or Joey for him, and since he didn’t seem to respond to well to either name we decided to try Mugsy; short for Mugwump. He has been responding to us just fine with that name. We surprised the kids, as they each come home at separate times in the afternoon. None of them knew of our plan, and were very excited to meet the little feller when I told him they were going home to meet their new fur-brother. He LOVES the kids. And by that I mean, this dog is seriously a kid lover. 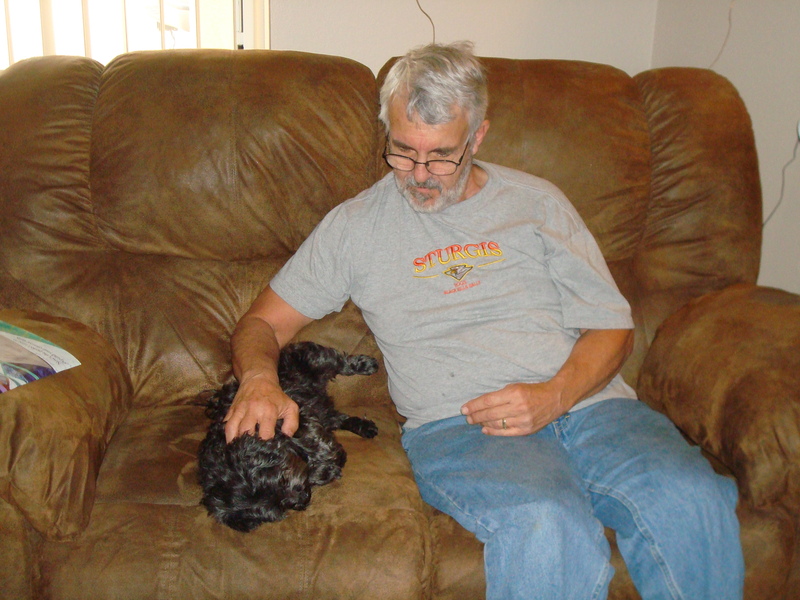 I am glad for that, because Shih Tzu’s tend to be one-person dogs only, but this one seems to love everyone. He may be a mix of some sort, and not pure-bred, which may be some of the reason he is doing so well with all of the people here. 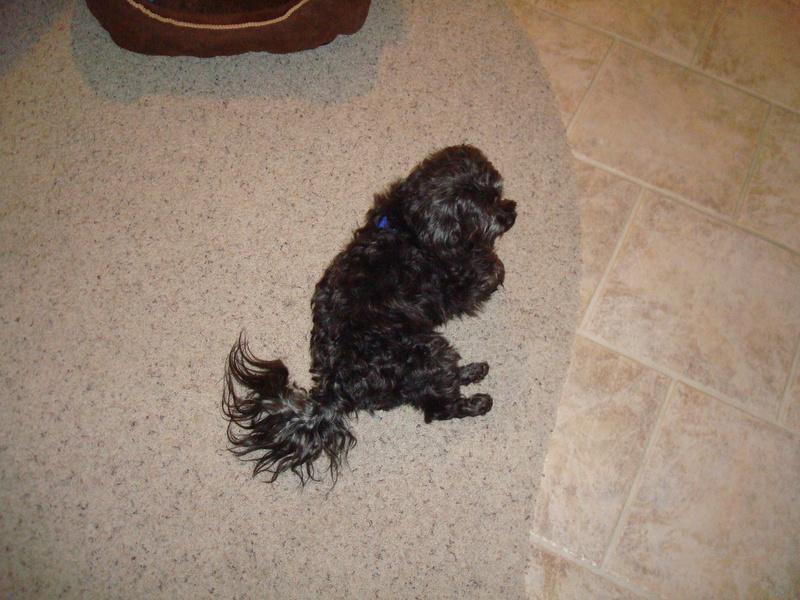 The daughter, who contacted us, seems to think he is Havanese, or maybe part Havanese, part Shih Tzu, which is its own breed: Havashu. Seriously. A Havashu in Havasu, how funny is that?! Anyway, he loves us, and we love him. His first day in the house has been great. He’s been relaxed, he’s napped, he’s eaten, and he’s done the potty thing in the right place. I am so glad! Do you have pets? How did they become a part of your family? So glad you guys found each other…sounds like a match made in Heaven…and how weird, a Havashu in Havasu! What ever works! Hi to you all, hope you are having a great winter! This poor doggit has been eating Purina. That brand gave our old Shih Tzus MAJOR NASTY Gas. As Mugsy jumped up beside me on the couch, he apparently relaxed and emitted a MAJOR SBD cloud, I now smell that Mugsy’s reaction to Purina is no different. EGADS. Soon we’ll get him switched to the good stuff…Innova. I didn’t want to give his poor little system too much to handle at once (new home, new people AND new food), but FOR THE LOVE OF ALL THAT IS HOLY….How does such a nasty smell come from such a cute little furrball?